This has got to be one of the weirdest fusions of genres that I have ever seen in a movie. A crime/gangster movie combined with science-fiction elements? Sounds crazy and like fun, but the problem with it is that the movie never knows how to be fun and therefore falls flat as entertainment. Can you still call a thriller a thriller when it's devoid of basically any form of tension and mystery? In any case, "Drone" is a very lacking movie, that maybe isn't terrible, but far from an engaging or remotely original movie. The lack of originality is only part of the movie. It however of course doesn't help very much that the movie is a very formulaic- and therefore also very predictable one. It's very easy to see where the movie is going and absolutely nothing comes as a surprise. It makes very little to throw in anything surprising, as if it was afraid to be different and unpredictable. It's really a very 'safe' movie, as are most movies involving the subject of drones. It's crazy, but it's as if most of these movies are afraid to offend or to start a discussion about some sensitive but relevant themes and questions. The movie does try to set up some mystery and tension, but since everything happens in such a predictable fashion and in such a dull tempo it all falls flat. It's even somewhat annoying, the way the movie stretches things out, while you already know where things are going. The right ideas where all still there, but the film-makers never manage to turn it into anything remotely surprising and engaging. Because it really isn't just the writing, but also definitely the way things get set up and build up in this movie that makes it such a disappointingly ineffective one. It's also being a very basic and straightforward movie, without offering much extra. There aren't a lot of characters and therefore also not an awful lot of plot lines to follow. Sometimes that's a good thing, but in this case the movie could have used any help from anything or anyone to spice things up a bit more at times. It's not a snorefest, but it nevertheless remains a slow moving movie, that unfortunately isn't ever heading anywhere interesting with anything. 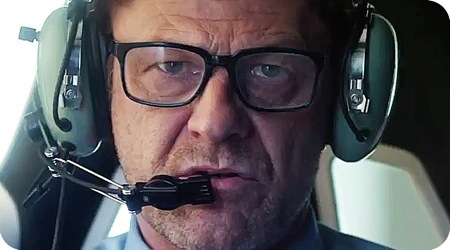 Sure, the presence of Sean Bean does give the movie something more and helps to make it stand out above just the average low-budget genre attempt, but I just really can't say that Bean's presence truly elevates the movie and brings it to an interesting and more high quality level. He's just there and doing his job, but i wouldn't call it a standout performance by him. Definitely nothing anyone is going to be talking about in a couple of years from now. Or who's going to talk about this movie anyway? I highly doubt that it's going to end up successful and becomes synonymous with Sean Bean's name. Redundant is probably the best way to describe this movie. It's never truly terrible, but it's all very safe, predictable and just not all that well done. An extremely forgettable and formulaic movie, that fails to impress with any of its thriller- and more deep and provoking themes and elements.